What Are the Slits for in My Window Frame? 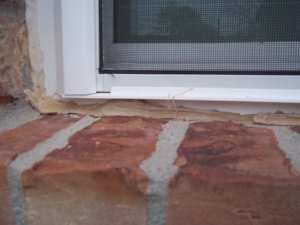 You are here: Home » » For the Homeowner » Home Maintenance-Consumer Info » What Are the Slits for in My Window Frame? Window manufacturers are always making slight improvements that we may not notice. Drainage holes for windows is one such innovation. But why do we need them? After I had finished giving a lecture, many attendees came up to ask me questions about their windows. For most people concerned with energy efficiency, we obsess about how inefficient they are. We are told to leave window replacement to the end of our green renovations, since they have a lower return on investment than other renovation items. What did surprise me is that people did not understand the design/function of the parts of the window. I guess this is a case of this is my job, so I should know, but on a normal basis, why should a homeowner think about it? I had a homeowner tell me that thought windows made with vinyl were inferior, because they associated vinyl with cheap. I explained that vinyl clad windows had the strength in the frame that they desired, but the vinyl helped with the problem of thermal bridging. Aluminum frames allow heat to transfer quickly, where vinyl takes longer. This is part of the U-factor. The U-factor is a description that places a value on the rate of heat transferring through materials (in this case a window). We want a low U-factor, since this will indicate better efficiencies. Another aspect of windows is that they control aspects of climate in the house, which we forget to control. They allow light to flood a space. They can be opened to allow in a breeze. This is why home inspectors check the quality of the screen. If you open the window for a breeze, you do not want insects or other pests coming into the home. We keep the weather out of the home when we close them. As windows advance in design, they can provide these functions better. Keeping the rain out, while allowing light is one function. This may not seem important to you, but windows do play their part in moisture control, which is essential in maintaining the home. Opening windows to allow moisture to flow out may not be a common practice anymore, but this used to be the main method of dealing with bathroom moisture. Closing the window to prevent rain from entering is another form of moisture control. During my home inspections, I do find water damage on the interior portions of the home due to open windows. With the old window design, we did not have to worry water staying by the window frame. Modern window design has one problem: the frame can hold water. The resolution to this is a simple fix: a slit (or hole) at the base of the frame allows water to escape. I mention this, because a few homeowners did not understand why those holes were there. After one inspection, I realized that maybe some builders did not know either. I was a manager for some years. I noticed that the best managers observed the work of their employees, and then reacted to those observations. Some managers made assumptions, and they pontificated on those beliefs. They were frequently wrong. I wonder if the construction managers know what to observe. In the case of the home in the photograph, There were a few careless mistakes, and one was at the base of the window frame. These windows have the slits, because water could be held inside the frame. The person responsible for caulking the wall joints smeared the caulk along the base of the frame, covering the hole. To correct this situation, they should clear the caulk away from the hole. Is caulking over the window frame slit a real issue? A perrennial question to home inspectors is asking about the importance of our findings. A common complaint is that we should not list some issues, since they are too minor of a concern. The problem becomes that minor concerns left untended can become major. Continual water damage at the frame leads to a situation where major damage can occur ( a rusted frame leads to a hole, which leads to water damage in the framing).Little things matter. This entry was posted on Thursday, August 25th, 2011 at 2:30 pm	and is filed under Home Maintenance-Consumer Info. You can follow any responses to this entry through the RSS 2.0 feed.